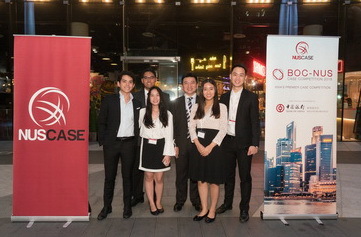 BOC-NUS Case Competition, one of the world�s most prestigious case competitions, was held during 3rd � 7th September 2018 in the sunny island of Singapore. The competition was organized by the NUS Business School and NUS Case Consulting Group with Bank of China as its Principal Partner. Celebrating its 10th iteration this year, the NUS Case Competition aims to make the Competition even more challenging by selectively invite 20 elite universities from 12 countries around the world�as opposed to the norm of 16 teams. Our team representative consists of Parit Keeratiyothin (BBA#24), Thitipong Sae-cai (#BBA24), Varalee Tananivit (BBA#24) and Premika Bhongsudhep (BBA#26) along with our advisor Ajarn Supawat Likittanawong. Upon our first day of arrival, we attended a short initial briefing followed by a warm welcoming dinner where the opening ceremony took place. Right then and there, team divisions were drawn, and this year case format was announced. Teams are randomly allocated into five divisions, consisting of 4 teams each. Placed in a division filled with teams of high potential, our team �The Riverside� is required to crack two cases including one 5-hour case and one 24-hour case. In which, the cases are weighted at 30% and 70% of the total points respectively. Team with the highest cumulative score from each division will proceed on to the final round and present the second case to another panel of judges. After a good night rest, we woke up to a relaxing day filled with fun and engaging activities. We had an amazing chance to explore Singapore while building up connections with international friends through the Amazing Race activity. Awaited us next was our long case company visit to Bank of China Singapore Branch, a leading bank in Singapore, seeking to set up an effective ecosystem in order to better position itself in the future amidst changes within the financial industry. Kicking off our fourth day with full faith in our team, we began cracking our 24-hour case. Times flew by quickly as we worked tirelessly against the clock to craft out what we thought was our masterpiece solution. Our hard work did pay off as the Riverside was announced as the champion of our division! Being one of the five teams, we proceeded on to the final round. Now to the real deal, as we stepped up on to the stage, our hearts were pounding so hard that we could hear it, but in that moment, nothing could interrupt our sheer determination, huge crowd energized us, we shined through the spotlight and delivered our recommendations to a wide panel of honorable judges and large crowd of audiences. 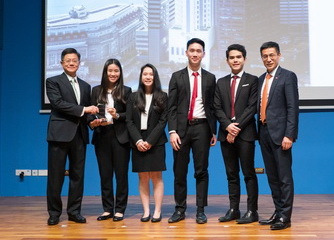 Finally, the moment of truth had come, representing Thammasat Business School, the Riverside team managed to emerge as this year 2nd runner up. Our achievement would not have been possible without the unweaving support and continual guidance from our professors, case team advisors and alumni. We would also like to extend our sincere gratitude to the BBA�s office staffs for helping to ease our processes. Adhering to our notion of Be the Best Always, we truly hope that this trophy would only be the first of many more to come.